Q: If i see (2) next to an item, is this how many are in the packet? Q: I live outside of the UK, will i be charged any tax? A: You will be responsible for any sales tax, VAT and import duties. Jersey Harley-Davidson® will not refund any taxes to non-UK delivery addresses or non-UK credit card addresses. Q: How long will it take for my goods to arrive? A: You must understand that we can't keep all items in stock and we have to order the majority of parts from Harley-Davidson®s warehouse in Belgium, (even they can't keep everything in stock and have to get some from the USA). We make every effort to get your goods off to you at the earliest opportunity. Should there be a delay of over 2 weeks to get them in from Harley we will send an email letting you know of the expected delay (so long as the information given by our supplier to us is correct). All orders that we receive should be with you within 2 weeks if the parts are in stock. Most items will be insured and "trackable" and not withstanding restraints caused by post-office limitations, general acts of god, etc. we will deliver on time. Q: I live outside of the UK, how much import duty will I be required to pay? A: You will need to contact your country's authorities and enquire with them. In many countries we expect that you can still make a significant saving. A: Payment is taken at the moment of order. Once a customer orders we have to order the part from Harley and unlike you we can’t cancel the part coming from Harley. So when customers decide to cancel we have to keep the part and a 20% cancelation fee has to be charged. If a part is cancelled that is on back order we can issue a full refund for that part without the 20% re-stocking charge. Please cancel at the time of notification of a back ordered part to avoid the 20% as once it has been sent from the states it will incur the charge. Q: What if the part is no longer available? A: If a part is no longer available or has been superseded, we will inform you the moment we find out and advise you of the new part number, or if we can't get the required part for you your account will be credited and we will inform you via email. 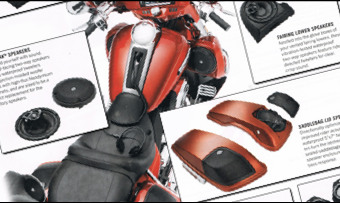 Download the latest accesories catalogue for your bike model.